Are all your Fantasy Baseball drafts done for the season? Are you looking to get that draft day high one more time, but don’t have the bandwidth to manage another team during the season? Then the Fantrax Best Ball Leagues are for you! Our own Mick Ciallela tried one out last week and shares his experience with you. I recently took part in a Best Ball draft here on Fantrax and wanted to post the results and provide my thoughts on the decision-making process during a draft. Before I delve into my draft recap, I highlighted some of the subtle nuances of this style of game when we introduced our game last season. I finished second in my 12-team league last year and wanted to keep most of those same concepts and principles in place. In that draft, I took starting pitchers with just six of my first 26 picks. I then pounded starters in the later rounds, ending up with a total of 15 starters over the course of 40 rounds. My fliers didn’t all hit, but the ones that did (Mike Foltynewicz, Hyun-Jin Ryu, and Zack Wheeler to name a few) were a huge help. This mindset is along the same lines with the strategy I discussed in a recent article where I highlighted the merits of building a pitching staff after the 14th round. In short, my focus was to get hitters who can steal bases and then grab a bunch of pitchers late. I wanted to incorporate that core philosophy while remaining flexible enough to take what the draft gave me. I also wanted to avoid relief pitchers if possible. There is so much uncertainty and turnover at the position that I just did not want to deal with it and carry potential dead weight. Below are my selections along with the reasoning behind them. My hope is that this will showcase the reality of a Best Ball draft, as opposed to a blanket strategy that may or may not work in any one draft. The first six picks of the draft did not go as I expected. I had my choice of Trea Turner, Nolan Arenado, and Ronald Acuna in this spot. That is how I have this trio ranked in season-long. But in Best Ball, I wanted the boost of Arenado’s home weeks. I may live to regret this decision if Turner really does end up with 70-80 stolen base attempts, but Arenado is a rock-solid contributor. Oh yeah. Did I mention I could have also had the reigning NL MVP in Round 1? Well, I took him in Round 2. Thanks. Benintendi checks all of the boxes. He can hit for average and will have a ton of scoring and RBI opportunities. He also has the ability to hit for power and steal bases. This feels a little late for Marte, who has been a very consistent performer for several years. I want no parts of Mondesi in season-long Roto at this price because the batted ball profile is not pretty. But he can certainly prove me wrong, and this format is perfect for his potential and skill set. Pitching went so fast in this draft. It felt a little weird, to be honest. Because pitchers sometimes get two starts in a given week, I want quantity over quality in Best Ball leagues, but I wanted to at least get one solid starter. Greinke was the 22nd SP off the board. Cain finished 32nd among hitters in this format last season. Despite the outfield overkill, I was happy with this value. Daniel Murphy went one pick before my turn. That is who I was targeting. At that point, I did not want to reach for another second baseman, so I grabbed Olson here. I am not as high on Robles as most people seem to be in redraft leagues, but he is another player like Mondesi who I want shares of in Best Ball leagues. He could easily steal 30 bases. PSA: you do not get to take advantage of players eligible at multiple positions in Best Ball leagues. But there are three Utility spots, which balances this out to a degree. I thought about drafting Mallex Smith here because of the stolen base boost but ultimately decided on Myers. After Smith went, I wanted to make sure I grabbed the next-best stolen base threat on the board. Gordon qualifies at second base which helped. I’ve got the fever! Bieber has elite command and should maintain solid ratios while putting up a decent number of innings. I wouldn’t classify him as an SP2 in standard leagues, but I am very comfortable with him here. In the article I linked above when I discussed late pitching, I mentioned that all of the Dodgers pitchers outside of Clayton Kershaw and Walker Buehler are being undervalued. I said they wouldn’t all hit this season, but that at least of a couple of them will and I don’t necessarily know which ones. What better format to hedge bets on than Best Ball? Love the potential here. If he can harness his control, he has the chance to be a top-20 pitcher who is currently being drafted outside the top-40. The guy had a 1.97 ERA and 1.01 WHIP with a K/9 of nearly 10.0. Yes, it was in 82 innings. But his good weeks are better than most. If he can surpass 100 innings, he will crush value this late. I settled on Taylor here, as Amed Rosario and Willy Adames both went before my pick. I thought about taking Rosario a round earlier but really wanted Ryu. Would Ryu have made it back if I took Rosario? I will never know. That is one of the most difficult realities of drafting. While a draft is happening, you have to assess not only your needs but the needs of others in the room as well. The guy who drafted Rosario right after my Ryu pick took Yusei Kikuchi right before my Taylor pick. If I am being honest, I think I like his combo better. We’ll see how it plays out. Clayton Kershaw is already doubtful for Opening Day, and Walker Buehler is being brought along slowly this spring. Stripling has a path to 25 starts and makes for a nice best ball target. Round 18, Pick 210: Ian Desmond – Ian Desmond may be on the downside of his career, but there are worse gambles you can make after pick 200 in best balls than to take a player who hits home runs, steals bases, and plays half his games in Coors Field. Did you think I was kidding about my stance on Dodgers’ pitchers? Practice what you preach, folks. I would never take all four of these pitchers in a season-long league. But at least two of them are going to outperform their draft stock in best ball leagues by a considerable margin. I’m not sure who will and who won’t, so I grabbed all four. YOLO. Musgrove is another pitcher who could end up being a massive bargain this season. Best ball leagues are all about upside, and Musgrove has it in spades. Man, the hate on Adam Eaton is real. He has a lot of skills for a player available this late. Would I bet on him playing 140 games this season? I would not. But in this format, he’s a solid gamble at this price. Martinez is another guy I want no part of in most formats. And if he comes back as a setup man rather than a starter or even a closer, this pick will not pan out. But I don’t mind the risk in this format and at this juncture of the draft. He could, in theory, either pick up 10 wins or 10 saves upon his return. James will probably begin the year either in the Astros’ bullpen or in the minors as a starter. I’d prefer the latter in the hopes that he gets called up to start at some point this season. He may not give me much, but I’ll take a shot here, especially considering Forrest Whitley went several rounds earlier. I think James outscores Whitley this year. Goodrum does not possess an elite skill but does everything pretty well. He is versatile enough that he should find consistent playing time and be able to contribute in a variety of ways. Weaver went at Pick #128 in this format last year. He was a massive disappointment in St. Louis but is still just 25 years old and still possesses the upside he did a season ago. He also now pitches in the same environment that helped facilitate Patrick Corbin’s breakout and Clay Buchholz’ return to fantasy relevance. It’s all about upside at this point of the draft, and I was very happy to grab Weaver here. DeScafani had a 4.93 ERA last season, but his 3.86 xFIP suggests room for growth. To that end, he has had a good spring thus far and should have a spot in an improved Reds’ rotation. If he can keep the ball in the yard, he should be able to put up solid numbers this year. Kiermaier is an outfielder who does a little bit of everything. He has 54 home runs and 70 steals in fewer than 2,000 plate appearances. Those are pretty solid rate stats for a player available this late. He may struggle to get 500 at-bats this season, but he should be plenty productive when he is in the lineup. Everyone is writing off 2017 as a fluke. But Zimmerman’s 2018 peripherals were perhaps even more impressive. Health is always a question mark, and a repeat of the 36 bombs he hit in 2017 is not happening. But he can hit 25 long balls and drive in 100 if he makes it through 130 games. I am happy to take that upside this late in the draft. Yes, I waited until Round 29 to pick a catcher. I try to avoid Alfaro in redraft leagues, but he does have some potential and should see plenty of playing time in Miami and hit in the middle of their lineup. Peralta had some flashes of brilliance a season ago. I believe he will start the season in the minors, but once he gets called up, he should be a solid contributor in most weeks. Camargo is a super-utility type for the Atlanta Braves, but he proved last season that he knows how to hit. There are many paths to him finding 400-500 at-bats. In this type of format, I want a piece of that action. I wanted to arm myself with three catchers, but the position is so bad. At this point, I decided to try a theory. I was going to try and “create” a second catcher with two spots. Yan Gomes and Kurt Suzuki were still available, as were Francisco Cervelli and Elias Diaz. I decided to select Gomes and see if Suzuki would fall back to me. He did. I would not have gone this route in a standard league. But I decided that if Alfaro did not pan out, I would rather invest in an entire entity rather than guesstimate which side of a platoon would receive more playing time. I think this also covers me in case either Washington catcher gets hurt. There is a decent chance Duggar leads off in San Francisco. If that is the case, Duggar should luck into 70-80 runs. He also possesses a decent power/speed combination. The entire offense in San Francisco is being avoided by most fantasy pundits, but someone on this team will emerge as a value. At this stage, I think Duggar is a good choice to be that player. Smith got a late start to spring as he recovers from lat surgery, and may need a few more weeks before he can crack the Miami rotation. But he has some strikeout upside and could be given a long look on a weak Miami team. Harrison will lead off most nights for the Tigers. Detroit does not figure to be a good team, but there are worse scenarios than hitting in front of Nicholas Castellanos and Miguel Cabrera. I also wanted some Goodrum insurance, because Harrison is someone who may threaten Goodrum’s playing time. I wanted to keep myself covered in case that scenario plays itself out. There is also a chance both can thrive, which would be ideal. I was going to go after pitching depth with my final four picks, but I was worried about a scenario where Mondesi falls on his face and Chris Taylor only plays part-time. In short, Ahmed is a body I can plug in at shortstop. Several of my pitchers are not guaranteed 30 starts, so I wanted to take someone who will toe the slab every five days. Giolito was among the worst starters in baseball last season. But it wasn’t that long ago that he was a top prospect. There is virtually no risk here. No, I am not fooling myself into thinking Adam Wainwright has much left in the tank. But with Carlos Martinez out and Alex Reyes likely to be relegated to the bullpen, Waino should begin the year in the rotation. I’m just looking for two solid months while Martinez, James, and Smith recover. Buchholz signed late and will likely take part in extended spring training and miss the first few weeks of the season. People forget how good Buchholz was in Arizona last year. He had a 2.01 ERA and 1.04 WHIP in 98.1 innings last year in the desert. Granted, the peripherals suggest a lot of that was good fortune, and the AL East is a bit different than the NL West. But Buchholz can throw six innings per start with an ERA around 4.00 and be totally worth this pick. Did my plan work? Sort of. Starting pitching was going fast and furious in the early rounds, which I was not expecting. I didn’t mind, because I was going to wait on pitching anyway. I planned on grabbing a lot of hitters with speed early. In that regard, I was quite successful. However, I think I went a little too outfield-happy early on. I think if I had drafted Merrifield over Benintendi or Murphy over Cain, I would have been more likely to grab Mallex Smith over Wil Myers. Those “either/or combo” scenarios are often difficult to forecast as a draft is unfolding. I do still really like Benintendi and Cain where I got them, so hopefully, it works out to my advantage. Again, it was just a matter of pitching going so early, which left an abundance of hitters available. I was not planning on taking every Dodger pitcher available in the middle rounds. Each time I took a Dodger pitcher, I had an alternative. I could have selected Nathan Eovaldi over Hill, Kikuchi over Ryu, Jesus Luzardo over Stripling, and Chris Paddack over Maeda. I really like all four of those alternatives in those spots. The odds of all four eclipsing their value exceed the odds of the Dodger quartet doing the same. But so do the chances of all four busting. If one of my Dodger pitchers gets hurt or fails to produce, another is likely to benefit. Basically, I’m hedging my bets. If two of the four turn out to be top-30 starting pitchers, I will be happy. I also really like Bieber, Glasnow, and Musgrove. Good thing nobody else in the fantasy community is on any of those guys. As I started filling up spots likely reserved for my bench, it was all about upside guys. Sure, Adam Eaton, Kevin Kiermaier, and Ryan Zimmerman can all miss chunks of time. But they can also be quite productive when they are in the lineup. I am hoping that the trio of Carlos Martinez, Josh James, and Freddy Peralta can give me some consistent innings by Memorial Day. In the meantime, I am hoping pitchers like Weaver and DeSclafani can take a step forward in 2019. The end game was all about depth and included some more hedging. I grabbed both Washington catchers rather than try to guess both sides of a couple of different platoon scenarios. Looking back, I could have drafted Danny Jansen over Stripling, and taken a Michael Pineda type over Alfaro. But there’s really no guarantee that P/C combination would be any better than what I ended up with. I grabbed Harrison to back up Goodrum and Wainwright to back up Martinez. No relievers were selected in the making of this best ball recap. Yes, technically Glasnow is listed as a reliever, but we all know he is really a starter. There were a couple of times I thought drafting a reliever because my league-mates were savvy enough to not overspend on such a volatile position. But ultimately I decided not to. All in all, I like the team I drafted. I don’t love it, which happens, but I like it. There are several players who I selected that I would avoid in standard Roto redraft leagues. But that is part of what makes Best Ball formats so much fun. You can take some risks and hope some lottery tickets come in. 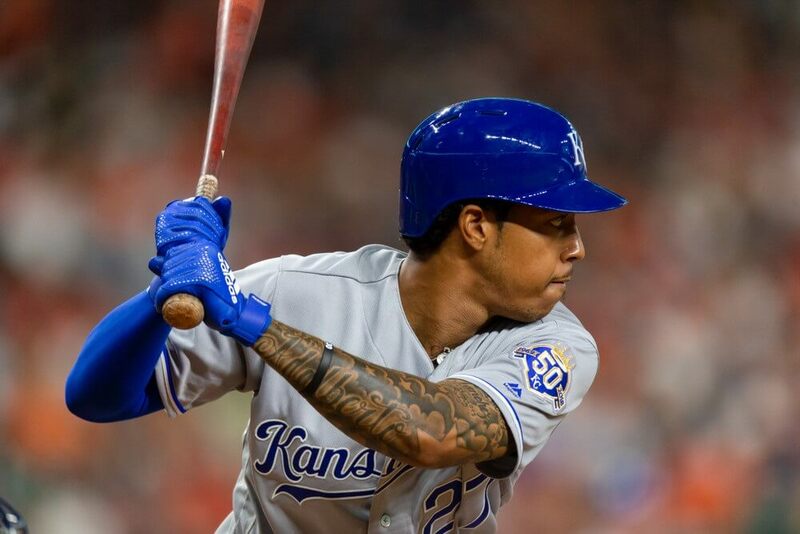 And you can hope Adalberto Mondesi learns how to make contact and maybe take a walk or two. Dollar and a dream.